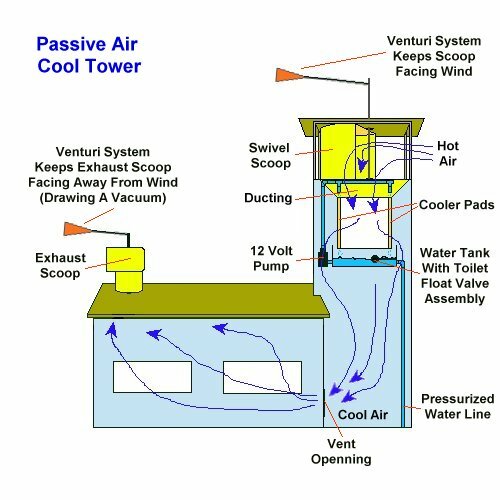 A cool tower requires no blowers or fans to move the cool air. The only power required is for a small 12 volt DC pump to circulate water over the cooler pads. Below you will find three different designs for cool towers in a graphic format. In general all three work on the same principles. 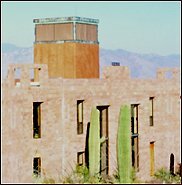 Cool towers use gravity to move cool air without any fans, although fans may be used to reduce the size of the towers. The most common cool towers do this by having a wet pad medium in the top of the tower. Since cool air is heavier than warm air, it will fall, creating its own airflow. Wind is not required, but will improve the airflow in a cool tower. Generally cool towers without fans are from 20 to 30 feet tall and between 6 and 10 feet square (6'x 6', to 10' x 10'). Typically cool towers of this size will require from 10 to 150 watts, and will cool 1,000 to 2,500 square feet. Airflow for these cool towers will range from 2,500 to 8,000 CFM (cubic ft. per minute). Passive ventilation systems rely on the movement of air through buildings to equalize pressure. The pressure difference can be caused by Wind or the Buoyancy effect created by stratified warm air. In either case, the amount of ventilation will depend critically on the size and placement of openings in the building. Buoyancy ventilation is more commonly referred to as temperature-induced or stack ventilation. Buoyancy results from differences in air density. The density of air depends on temperature and humidity. Cool air is heavier than warm air at the same humidity. Thus, airflow is generated by the dropping of heavier air, forcing lighter air to exhaust. Tower height, or the distance from the air intake (top of tower) to the air outlet (bottom of tower), will determine the velocity or pressure of the air. The greater this distance the more air pressure created, similar to a water column. The tower uses a column of cool moist air (compared to the hot dry air outside) to create this pressure. Wind causes a positive pressure on the windward side and a negative pressure on the leeward side of buildings. To equalize pressure, fresh air will enter any windward opening and be exhausted from any leeward opening. Cooler pads sit at the top of a tower with a pump re-circulating water over them. As hot air passes through the pads it is cooled by the evaporation of the water. Cool moist air is heavier than hot dry air and drops down the tower and into your house. In order for the cool air to flow in, hot air must be exhausted. Your tower should be a minimum of 6 ft. x 6ft. square and 25 ft. in height, most are about 30 ft. tall. Your tower should be insulated with at least an R-10 Factor, but R-19 or higher would be better. 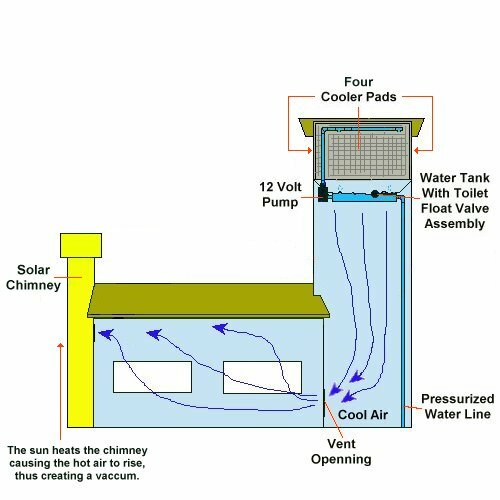 Where prevailing breezes are not dependable enough to rely on wind-induced ventilation and where keeping indoor temperature sufficiently lower than outdoor temperature to induce buoyant flow is a problem, then a solar chimney may be an effective solution. The chimney is isolated from the occupied space and can be heated as much as possible by the sun or other means. Hot air is simply exhausted out the top of the chimney creating a suction at the bottom which is used to extract indoor air. 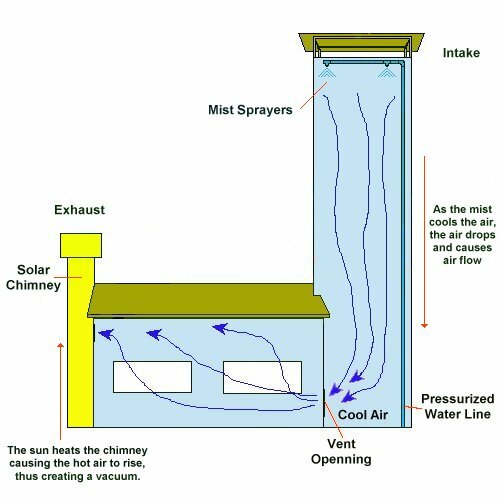 A large solar chimney can be used to exhaust the air from your home, but a downwind swiveling exhaust scoop is a better alternative. The more exhaust scoops you have the better. These enhancements will increase the air flow; using upwind and downwind scoops that swivel to orient the wind is the best choice. If using wind, your cooler pads will be at the top or inside of the tower, depending on the design. Just below the cooler pads you should have a tank containing 15-30 gallons of water with a float valve assembly to keep the tank full. Locate outside the tank a small 12 Volt pump. It is best to use a non submergible pump. Evaporating water is what creates the cooling and makes evaporative coolers and cool towers work. Rain water is the perfect source for the water used in cool towers because it does not have dissolved salts or minerals. Well water can contain dissolved minerals. As the water evaporates from the cooler pads, whatever minerals it contains are left behind. This buildup can eventually clog the pads and block air flow. This is the most basic design and is not recommend for most, due to the "high cost to low efficiency" ratio. This tower requires a very long drop and the resulting cost of a tall tower could be better spent on a more advanced design system. The tower would have to be wider in diameter to support it's height. This system operates only on the Buoyancy Principle described above and does not require wind to operate. If you live in an area with no wind, then this is the tower for you. This is the most common cool tower in use. As wind blows through the wet pads, the water evaporates and cools the air. Placing pads at the top of the tower usually requires appropriately 70-80 square feet of pads. With evaporative coolers you must leave an exit for the air to escape from your house. In normal water coolers a blower circulates the air, in this design wind and buoyancy will do the job for you. Standard cooler pads will work, but there are better, more efficient pads available that have less wind resistance . Of course these higher quality pads will cost more. Water must flow down the pads and air must pass through them in order to have the evaporation needed to cool the air. Vents must have a larger opening than those used with a forced air system because there is no pressurized fan blower in this system. This tower is 6 x 6 x 30 ft in dimensions. To create a larger air flow down the cool tower, install one large upwind swivel scoop above the pads in the tower. Your air scoops should have a venturi system (tail) to keep the scoop oriented into the wind. Instead of one large exhaust vent for the hot air, install smaller openings in the roof with down wind swivel scoops to remove the heat. Your exhaust vents should also swivel with a venturi system to keep the exhaust openings oriented away from the wind. With this system the wind can blow from any direction and your cool tower will continue to function. This is a more efficient design than using a solar chimney. The intake air scoop should be made out of light aluminum or designed with an aluminum frame with canvas stretched over it. The canvas scoop is recommended because it is lighter and generates almost no noise. In this design the pads are just below the scoop inside the tower with ducting to direct the air flow into and through the pads . This reduces the size and area of the cooler pads, thus reducing the cost. This design requires about 20 square ft. of 4 in. thick pads. Cooler pads that are inside the tower and below the scoop are protected from direct sun light and last longer due to lack of UV damage caused by the sun. The tower itself is 6 ft. square and 30 ft. in height. The air scoop occupies the top 4 ft. Two pads about 3 ft. square by 4 in. thick are located just below the air scoop. With this design you can also add removable doors to close off the top of the tower incase of a wind storm.